What do these dates have in common? They are significant to our State, County, and City. Statehood in Missouri was a dramatic event caused by the Missouri Compromise of 1820. In order to maintain a semblance of balance between the north and south and free and slave, Missouri was allowed to enter the Union as a slave state with Maine as a free state. This compromise, while seeming to be a perfect solution to a troubling issue, was to haunt Missouri far into the future. Land and families were mired in arguments and rivalries long after the Civil War. Stories are still told by families about bushwhackers and murders in the name of ideology, freedom, and civility among Missouri citizens. Imagine what would become Butler County in 1849. It was carved out of Wayne County to the north. On the south just north of the 36° 30’ parallel was what became Arkansas in 1836. The Black River split the county coming through the Ozark foothills from Reynolds and Wayne Counties meandering through the swamps to Arkansas. The eastern side of the County was the swamps and timberlands of multiple tree species with oak and cypress being the money trees. This eastern half was bordered by the St. Francis River. Both the Black and St. Francis were navigable streams with many tributaries. In 1849, Butler County was formed as a governmental unit. Much of the early settlement was at Cane Creek, west of what was to become Poplar Bluff. The choice of Poplar Bluff might seem illogical since the population center was Cane Creek, but the first commissioners made the choice to find a geographically central location for the county seat. What was to become Poplar Bluff lay on the banks of the Black River and was at the meeting edge of the swamps and the Ozark foothills. Necessary services for this community were established as plats of land were sold and secured. This included laying out the streets and a new post office. Poplar Bluff became an established town in 1870. Mercantile establishments, fur traders and the usual conveniences of a frontier town grew. The growth of Poplar Bluff is not only attributable to river navigation and the timber industry, but also the railroads providing north, south, east and west avenues of distribution for barrel staves, handles, wagons, whiskey, concrete blocks, bricks, and tiles. Over the next three years, we will celebrate our statehood (2021—Bicentennial, 200 years), county (2019–170 years), and city (2020—Sesquicentennial, 150 years). 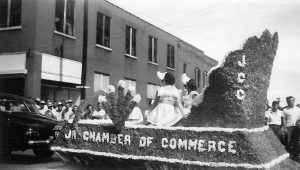 Join those who follow Poplar Bluff Vintage on Facebook, read a book about our state and region, visit Poplar Bluff and our county to be a part of our joyous celebrations, and invite your family and friends to be a part of our rich heritage. Deem, David Bruce. History of Butler County Missouri : a narrative account of its historical progress, its people and its principal interests. Biographical sketches by Roberts V. Stanard. 2nd ed. Poplar Bluff, MO : Poplar Bluff Printing Company, 1940. Butler County sesquicentennial celebration : 1849-1999. Butler County Centennial committee. Souvenir Program Butler County Centennial Jubilee Poplar Bluff, Missouri 1849-1949, August 31 thru September 3. The history of Butler County industry 1870-1930. 1983. Houck, Louis. A history of Missouri : from the earliest explorations and settlements until the admission of the state into the union. Chicago: Donnelly, 1908. Stanard, John R. Butler County: a pictorial history. Vol. 1-2. Virginia Beach, Virginia: The Donning Company, 1993-94.